Feed Your Soul. Transform Your Life. Join the Revolution. LIFETIME ACCESS IS NOW AVAILABLE. View past student work here. I believe passionately in every human’s ability to create, and I know deep down in my bones that creative expression is a crucial part of holistic well-being. Just like moving your body, eating well, and fostering healthy relationships, fortifying your creative muscles is another powerful way to cultivate more happiness, healthiness, and confidence in your life — not to mention more spontaneity, innovation, connection, and play! But your days are full, yes? And creativity is often the first thing to go when life gets hectic. But just like so many other things that feed your soul, staying connected to your creative desires and outlets, especially when you’re busy, can provide the fertile ground that makes everything else thrive. 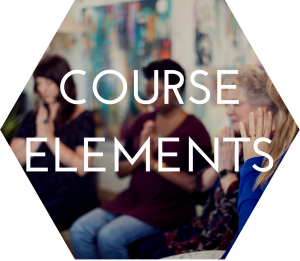 In many ways, I created this course because it’s exactly the kind of art medicine I’ve been seeking in my own life. While I’ll always love creating large-scale acrylic paintings, I’ve been craving a more integrated kind of creativity — the kind that easily weaves itself into all aspects of my life — the kind that simply becomes my life. This soulful, accessible, empowering, and FUN approach to creativity is what the Creative Revolution E-Course is all about. Bringing to life and expanding upon my latest book, the Creative Revolution E-Course combines the spontaneity and warmth of an in-person workshop with the ease and accessibility of an online offering. I invite you to join me and a fantastic group of students (you’re going to love them!) as we explore brand new Creative Exercises, invigorating Movement Sequences, Morning and Evening Sanctuaries, The Art of Aliveness Series, and so much more. Designed to expand or contract to fit your life at any given moment, you’re invited to explore the course at your own pace or follow along with your international tribe of movers, makers + shakers. Spend five minutes or spend five hours — whatever works for you! You’ll also have access to the entire course for six months (from the course begin date), so there’s truly no need to rush. For materials, you won’t need any fancy, expensive art supplies or a big space to create. All the Creative Exercises can be done right at your kitchen table with simple supplies that you might already have. Many other aspects of the course are meant to be experienced easefully throughout your day with no extra materials needed. This offering has been in my heart and mind for the past year, and it’s unlike anything else I’ve created. I promise it will not feel like yet another item on your to-do list. Instead, it will feel like coming home to yourself again and again. Flora is not only a talented painter, she is a generous teacher. She actively helps others find and activate creative expression. This is her most far-reaching gift. Twenty-one, brand new, mixed media, Creative Exercises designed to reinvigorate any creative practice. The intention behind these mixed-media art-making activities is not to produce finished works of art. Rather, they are meant as jumping off points, focusing on play, experimentation, and letting go. Each week features three Creative Exercises presented to seven wonderful students with plenty of guidance, support, and encouragement along the way. Check out a full-length exercise here! Seven Movement Sequences bring a variety of visual art making principles such as contrast, fluidity, flow, and shape shifting to life each week. The sequences are designed for all body types and can be done sitting or standing. In addition to the Movement Sequences, you’ll also find downloadable audio tracks to get you moving and grooving at home. Each week presents one new Movement Sequence to explore. Learn more here. The Art of Aliveness Series presents simple yet compelling ways to weave more creativity throughout your daily life. These weekly prompts and suggestions won’t require more materials or any extra time. Instead, they’re about shifting your awareness, attention, and curiosity toward more meaningful, creative, and connected ways of being each day. Each week presents a new theme to explore through written content, photos, links, and audio files. Learn more here. Fourteen Morning and Evening Sanctuaries offer simple and delicious ways to begin and end your days through invigorating and nourishing practices. Some Sanctuaries will require basic supplies like pen and paper, while others simply depend on your open heart and mind. The entire series is meant to offer you a beautiful array of mindful rituals to explore and integrate into your life during and after the course. Each week presents two new Sanctuaries delivered through written content, photos, links, and audio files. Learn more here. The Wayfinding Guide is a gorgeous multi-page PDF full of original, creative coaching prompts and practices to take you deeper into the course content. Through beautiful images and thought-provoking inquiry, the Wayfinding Guide asks all the right questions, motivates action and accountability, and supports you to catalyze your creative cravings. 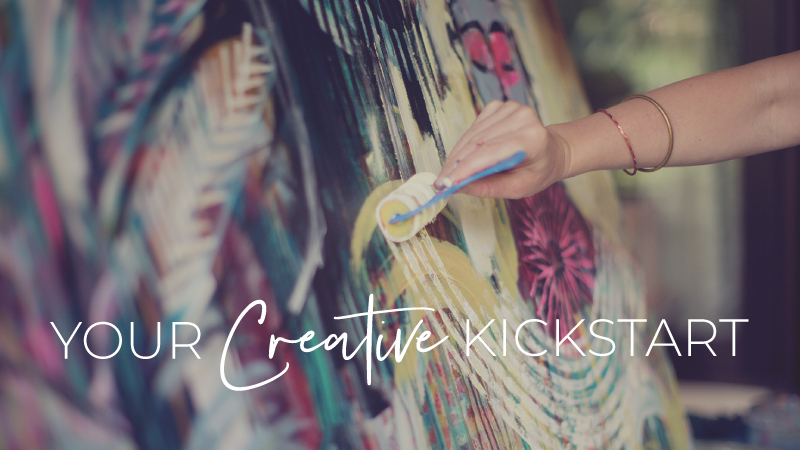 Receive tangible tools to personalize your creative journey in the Creative Revolution E-Course, and beyond, 39 beautiful pages to print and keep (forever! ), 8 Weekly Worksheets to take you from reflection to action, 8 Creative Calendars to map your path through each week’s content, and 10 Prompts + Practices to translate The Creative Revolution exercises into your unique daily life. Over thirty-five, professionally shot, HD videos featuring three camera angles and professional sound and lighting, all shot in my Portland, OR, studio. A live classroom experience! We’ll begin together and move through the course as a tribe to stay more accountable and foster deeper relationships. If you prefer to be more independent, you can also move through the course at your own unique rhythm. Twenty-one videos exploring new, mixed-media Creative Exercises with a group of seven students. Seven videos exploring weekly Movement Sequences with our group. Over twenty-one original audio files featuring The Art of Aliveness Series, Morning and Evening Sanctuaries, meditations, and more. A 39-page Wayfinding Guide PDF to deepen your creative journey. 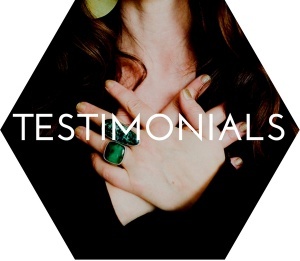 Extensive written content, gorgeous photography, and additional resources. Eleven pre-recorded video q + a’s with Flora. Access to a community of spirited, creative people from across the world, via a secret Facebook group — your new creative community! This group will remain open and active after the course is over. Continued support and bonus prompts from Flora. A transformational, accessible, and lasting way to integrate more creativity into your everyday life. The Creative Revolution E-Course is designed to be accessible and doable. This means simple supplies that can be used at your kitchen table, in your bedroom, basement, yard, or magical art-making fort. Many of the exercises require no materials at all. The following supplies are recommended, but I encourage you to use whatever materials you can easily get your hands on. All the creative exercises can be modified to work with what you have, and you can always add in more materials as you go. You can find some of my favorite brands at a variety of price points for these materials here. I believe giving back to my community is an essential part of living and breathing. As a reflection of this core value, and to support much-needed arts funding, I am honored to donate 5% percent of the revenue generated from every full-length online course sold to one of my favorite Portland-based non-profit organizations: p:ear. I believe deeply in the work this organization is doing to bring the healing power of art to youth in need, and I’m thrilled to support their mission and vision. Thank you for helping me make these gifts possible! Read more about my Community Giveback Program here. If you have taken the Creative Revolution E-Course before and would love to join us again with lifetime access, please e-mail teamlove@florabowley.com for a special alumni discount! When and where is the class? The Creative Revolution E-Course is now available with Lifetime Access! If you are an alumni of the course, you can receive lifetime access for just $99. Email teamlove@florabowley.com for more details. This is an online course and can be accessed anywhere in the world where high-speed internet is available. How much is it, and how do I register? What if I can't afford it? The Creative Revolution E-Course is available for $390 USD. I want this course to be accessible to everyone who is interested in exploring their own creative revolution. If financial restrictions are keeping you from participating, I’m happy to offer reduced rate and full scholarships to make this possible. Please email teamlove@florabowley.com for more information. 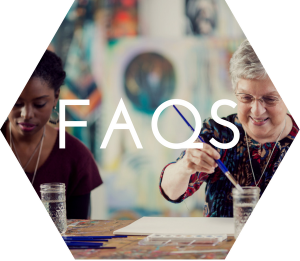 Additionally, a percentage of all E-Courses sold will be donated to a thoughtfully chosen, arts-based organization through the Community Giveback Program. Our current beneficiary is CHAP (Children’s Healing Art Project) in Portland, OR. 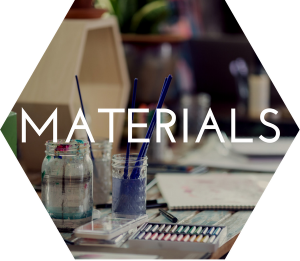 The following materials are recommended for this course, but I encourage you to use whatever materials are easily accessible for you. All of the creative exercises can be modified to work with what you have, and you can always add in more materials as you go. What are the differences between this course and the Bloom True E-Course, Studio Diaries, and The Painting Sessions? Great question! In a nutshell, The Creative Revolution E-Course differs from all my other courses in that it focuses on integrating creativity into your everyday life through accessible, “table top,” mixed media creative exercises, movement, and holistic daily practices. All of my other courses focus mainly on large-scale, acrylic painting in my Brave Intuitive Painting style. 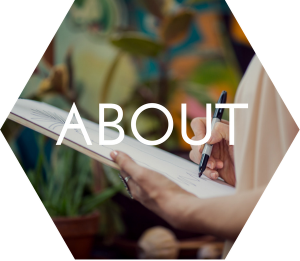 Below you’ll find descriptions and what to expect in each course. If you have other, specific questions, please don’t hesitate to write us at: teamlove@florabowley.com. This is my original, five-week, online painting course where you’ll find gentle guidance and practical step-by-step support as I demonstrate my entire Brave Intuitive Painting process through the evolution of three, large paintings from start to finish. If you’re looking for in-depth guidance for large-scale acrylic painting with a focus on letting go, trusting your intuition, and courageously being open to change, this is it! Brimming with gorgeous, high-definition video demonstrations, unique creative lessons, inspiring prompts, interviews with fellow artists, in-depth Q&A sessions, and enough encouragement and inspiration to last a lifetime, the Bloom True E-Course presents a groundbreaking, transformational approach to painting and living that celebrates intuition, connects body, mind and spirit, and allows unique, expressive paintings to emerge naturally. This thoughtfully designed course was created to support both first-time painters and professional artists (and everyone else in-between!) as you move through fear, embrace intuition, find your own style and open up to a new world of creative possibilities. Please note, you’ll need space to make a mess, large surfaces to paint on, and a set of acrylic paints for this course. The Bloom True E-Course is available to join at anytime for $297. Once you join, it’s yours to enjoy for life. I created the Studio Diaries as a way of inviting you inside my studio every month to explore specific themes from a variety of perspectives. Monthly themes include: Staying Inspired, Finding Your Style, Collaboration, Exploring Dynamic Contrast, The Art of Simplicity, Making Peace with Your Inner Critic, How to Finish a Painting, The Power of Play, Creative Business with Heart, and Making it Personal. The themes are explored through video-based creative exercises (mostly painting), written content, interviews and contributions from other artists, an exclusive Q + A podcast, extensive links and resources, audio tracks, monthly playlists, and more. To get a better idea of what a Studio Diary looks and feels like, I invite you to enjoy a free Sample Diary, or check out the entire Library of Monthly Themes. Each Diary is available a la carte for just $36, and a Full Year of Studio Diaries is available for $249. Once you purchase a Studio Diary, it’s yours to keep and enjoy for life. The Painting Sessions is an offering where you can watch a painting come to life from start-to-finish. Each lovingly crafted Painting Session includes a series of professionally shot videos to give you an up-close view of my Brave Intuitive Painting process. From the first brush strokes (or finger swipes as the case may be), through all my radically shifting layers (and dance moves), up to my finishing touches, each Session gives you an intimate and educational glimpse into the creation of a brand new painting. To give you even more insight into the ‘why’ and ‘how’ behind the process, each video is also accompanied by a voice-over track where I’ll share my honest thoughts, struggles, breakthroughs and favorite new tricks along the way. You can purchase Individual Painting Sessions at anytime for $36 and keep them for life, or purchase A Year of Painting Sessions for a 20% discount on all 12! I haven’t painted before. Is this class for me? Yes! The Creative Revolution E-Course is a perfect place to begin your creative art-making adventure. I will gently guide you through all the Creative Exercises, while giving you options, encouragement, and tips along the way. This course is not about finishing masterpieces. Instead, it’s about getting your creative juices flowing, learning about new materials, and weaving more creative action and creative ways of being into your everyday life. I am already a professional artist. Is this class for me? Yes! Even if you have been making art for years, the Creative Revolution E-Course will offer fresh new ways to approach your creative process with an emphasis on letting go, exploration, and play. The course is also designed to invite more creativity into your life outside the studio. On a personal note, I’ve been painting for over twenty years, and returning to this particular set of creative life practices and exercises has sparked a whole new wave of inspiration that I’ve been missing for years. True story! You’re craving new creative inspiration in your art making practices. You’re seeking more creative ways of being in your everyday life. You don’t have much time or space to create, but you’re looking for easeful ways of incorporating more creativity and creative action into your life. You believe creativity is a vital part of your holistic well-being. This course is NOT for you if you are looking for a course on specific painting techniques or guidance around creating finished pieces of art. For more of that flavor of guidance, head on over to my Bloom True E-Course, Studio Diaries, and Painting Sessions. I’ve never taken an online class before. How does it work? Do I need to be at my computer at a certain time? Once you join the Creative Revolution E-Course, you’ll be able to access all seven weeks of course material when you log into your account. You can choose to work through the course content with your fellow revolutionaries, week by week, or explore it all at your own pace. You’ll have access to all the course content for life. Will I be able to communicate with others during the course? Yes, you will have access to the private Creative Revolution Facebook Community where you can connect with others and share images and reflections based on the exercises and prompts offered in the course. This community space is open to all current Creative Revolution E-Course students (more students will continue to join the group with the next iteration of the course). This community provides a wonderful and inspiring place to connect and share your Creative Revolution experience. It will remain open indefinitely. Can I ask questions directly to Flora? There will be occasional live video calls on Flora’s facebook page where you’ll be able to ask questions, receive feedback, guidance, and support (and other goodies!). The private Facebook group will also be a wonderful forum for asking questions and getting feedback from your fellow revolutionaries. For any technical or logistic questions, Flora’s team is available and happy to help you Monday – Friday. Simply email teamlove@florabowley.com for support. How much physical space will I need? The Creative Revolution E-Course was designed to fit easily into your life without the need for a messy studio space. All the creative exercises can be done right at your kitchen table! Do I need a high-speed Internet connection to view the course videos? Yes, all videos in the Creative Revolution E-Course are shot in HD and are high quality, so you’ll need a fairly high-speed Internet connection to view them. The videos are a vital part of the content of this course, so please do consider this. We’re not able to provide alternative viewing options for people on dial-up or on very slow connections (and we cannot give refunds if you are having issues viewing the videos due to your internet connection). Therefore, please bear this in mind when registering. If you have regular broadband, you should be just fine! What if I have issues playing back video? Web-browser issues: Some browsers may not support the Vimeo player. (Older versions of Firefox and Internet-Explorer seem to be problematic). Try launching the classroom in a different Browser: we’re finding Chrome and Safari to be the most stable. Full-screen: Click on the four tiny arrows next to the Vimeo logo to watch the video in full screen. You can use the escape button to return to the post. If problems persist, please send us an email at: teamlove@florabowley.com, and we’ll get back to you asap. What if I have issues with the E-Course not showing up right on my phone, tablet or desktop? The Creative Revolution E-Course, as well as the rest of my site, was designed from the ground up to be viewable on a wide range of devices. This includes desktops, phones and tablets. However, there are some limitations. If you’re experiencing issues with how the E-Course or any other part of the site is looking and working, try finding out what browser version you’re using. Click here to find out. The most popular browsers that visit my site are listed below. If you’re seeing an issue with the way anything is showing up on your mobile device, desktop or tablet, or if something just doesn’t seem quite right, please send an email directly to the awesome team at 7/Apps (support@7apps.com). Emails to them should be specifically about the site not working on your device. Before you reach out to them, please check what version of browser and what operating system you’re using (you’ll need to tell them that in your email), and try to update to the newest your hardware can support. If that doesn’t resolve the issue, send them a note. Still stuck? You can always send us an email at: teamlove@florabowley.com, we’ll get back to you asap. How do I access the course material? Once you purchase the course, you’ll be able to access all seven-weeks of content for life. At this time, please use the Login Area at the top of the website and enter your username and password (generated when you purchased the Course). Once you’re logged in, you can access the course at any time by clicking your name (at the top of the site) and using the drop-down menu to select the ‘Online Courses’ option. The Creative Revolution E-Course will magically be there waiting for you. At that time, click ‘View’ to join the revolution! If you wish to change your password at any time, please click the ‘Forgot your password’ link. Can I give this to a friend as a gift? I believe giving the gift of Creative Revolution is a gift that keeps giving. We have gift certificates available here. Just choose the amount of the course, and you’ll be good to go! If the course does not meet your expectations, we are happy to give you a full refund within one week of your purchase. After that, there are no refunds or extensions for this course. Thank you for understanding. The amazing students who joined me for the filming of this course: Emmy Eao, John Blomgren, Kathy Terry, Lynzee Lynx, Nikki Cade, Shannon Sims, and Tara Morris. Photographers: Zippy Lomax and Danielle Cohen.